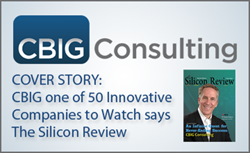 Global leader in Big Data analytics services CBIG Consulting made news again this week, this time as the featured cover story in The Silicon Review’s special June 2016 edition featuring “50 Innovative Companies to Watch.” The Silicon Review is a digital/print publication that serves as an impartial resource for sharing innovations in enterprise solutions, routinely examining trending solution providers for a diverse readership that includes many technology decision makers and senior level IT buyers. SR’s article on the firm, “An Infinite Quest for Never-Ending Success,” offers an inside look at CBIG’s evolution into one of the most in-demand providers of business intelligence services today. SR’s editors conducted a Q&A session with CBIG President Todd Nash to gain an in-depth profile on CBIG Consulting’s background, prevailing business philosophy, and advancements in the Big Data analytics domain. CBIG Consulting is an international team of experts in Business Intelligence, Big Data Analytics, Data Warehousing, and Cloud-based Analytics platforms. Named a top BI and Big Data consulting firm by independent research organizations and publications, CBIG’s management consultants, business analysts, data scientists, architects and engineers are seasoned professionals dedicated to the analytics space. CBIG works with global enterprises, mid-size businesses, and non-profit organizations in solving mission-critical reporting and analytical needs. CBIG is headquartered in the Chicago area and has additional offices in San Francisco, Boston, Denver, Austin, Raleigh, Irvine and Seattle in the U.S.; Sydney, Melbourne, Auckland and Singapore serving the Asia-Pacific region; and London serving the EMEA region. For more information, please visit http://www.cbigconsulting.com.